Time was tight last week as Canadian Prime Minister Justin Trudeau was speared with pointed questions from the public and journalists during his stop at TRU. With only a small window of time, Trudeau could not answer everyone. Those he called on to ask their questions needed luck. TRU journalism student Nada Abdelghaffar was among the fortunate. She asked Canada’s 23rd prime minister her question about an issue she deals with every day. Raised in Cairo, Egypt, Abdelghaffar faces an additional challenge from most journalists: she was born blind. Growing up, she relied on her family to get around in a city that severely lacked accessibility support for the visually disabled. “They don’t have the basic needs for walking, like canes or dogs. I always needed the help of someone else,” said Abdelghaffar, who was born with congenital glaucoma. She left her homeland after graduating high school and chose TRU because of its smaller size and accessibility. Language wasn’t an issue as Abdelghaffar has studied English since kindergarten. She arrived all on her own in January of 2017 for the winter semester. It was her first time travelling to North America and her second outside of Egypt. After she landed, TRU connected Abdelghaffar with the Canadian National Institute for the Blind. They gave her tips for maneuvering around campus and gave her a collapsible white cane. Her mother came out in July to provide more support, even though Abdelghaffar was becoming self-sufficient. Her mom returned to Egypt near the end of the fall semester. 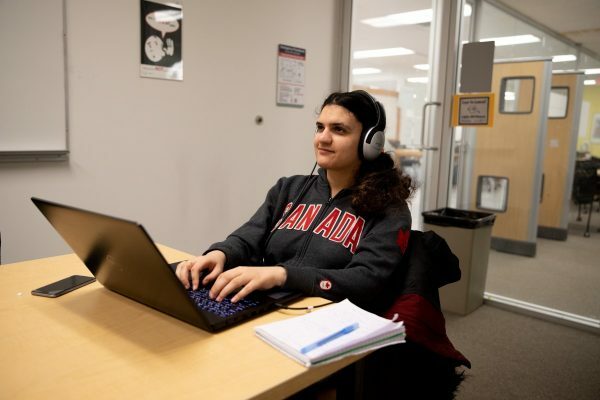 Nada Abdelghaffar has screen-reading software that allows her to keep pace with the rest of her journalism classmates. Abdelghaffar’s basics for life were taken care of, but she still needed some help. TRU assisted by converting her textbooks into computer documents, which allowed her screen-reading software to convert text into audio clips. The program also reads out each key she types, so she can file articles on time. She also puts her smart phone to work for her. The iPhone has a VoiceOver feature which, with a series of taps, indicates which app she is using and the action she is performing. It’s allowed her to run her Facebook and Twitter accounts, which is where her interest in journalism began. Abdelghaffar wanted to be heard, so she began tweeting in 2011 about the Arab Spring—a series of anti-government protests that spread to Egypt. 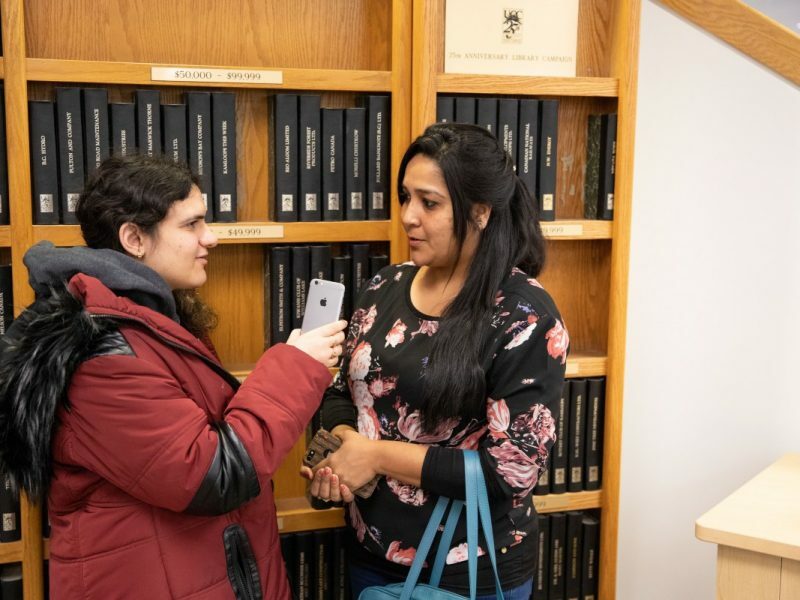 “I thought journalism was a good way to deliver messages and thoughtful ideas to everyone,” said Abdelghaffar, who runs her own radio show Saturdays at CFBX 92.5FM from 1 to 2 p.m. Even in 2019, accessibility for disabled reporters is an issue. Abdelghaffar discovered this while on assignment at a Kamloops City Council meeting. She took notes and recorded quotes, but had trouble distinguishing who was speaking. “As a journalist, you need to be accurate. If you misquote someone, your credibility suffers,” she said. Which is why she raised accessibility with the prime minister last week at the Town Hall. “I told him my situation and asked him how we could make government meetings accessible for visually impaired citizens,” she recalled. Trudeau paused and responded. He asked Abdelghaffar for her contact information so he could follow up with her. Even with the odds stacked against her from day one, Abdelghaffar is trying to make a difference in her new country. She even has the prime minister working with her.